This is the first in a series of posts about structures and other features of the Bloomingdale neighborhood that are no longer here. 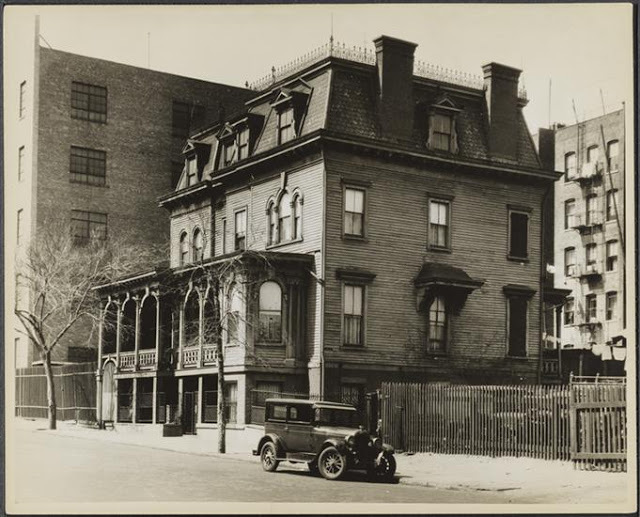 This post was written by Pam Tice, a member of the Bloomingdale Neighborhood History Group’s Planning Committee. 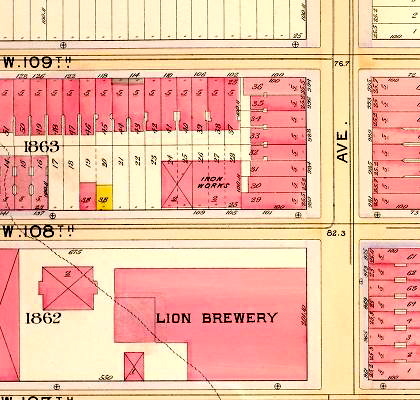 For nearly 100 years, the sprawling Lion Brewery — and its nearby Park — took up the blocks 107 to 109 Streets between Ninth and Tenth Avenues, named Columbus Avenue and Amsterdam Avenue in 1890. August Schmid died in 1889, and his partner Emmanuel Bernheimer in 1890. Both were wealthy men, leaving significant estates. Bernheimer had three sons who had already begun to play important roles in running the Lion Brewery. Schmid had two daughters, but one died as a young woman. For the Schmid family, his wife Josephine took over the management role. Soon, she and the Bernheimer sons were arguing over operations, and, in 1901, they went to court. After lengthy arguments about the additional real estate that the company owned. 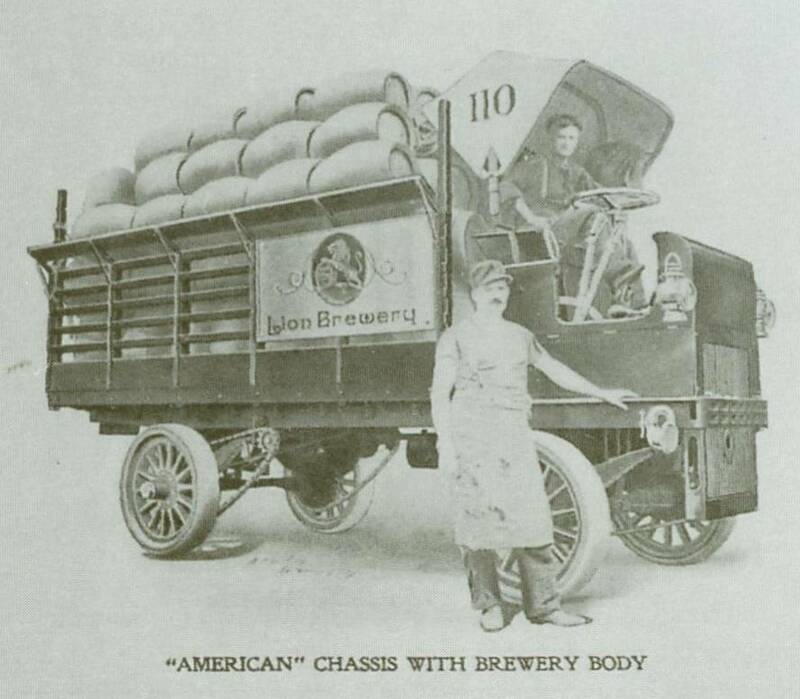 Mrs. Schmid became the sole owner of the Brewery in 1903. There were changes also at the Lion Palace. 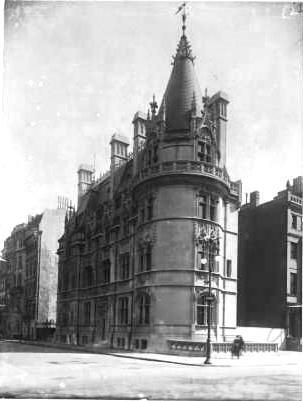 In 1906, Mrs. Schmid leased it to two theatrical men who planned to convert it from a music hall into a theater. This venture must have lasted only a short time, because the company they formed was in foreclosure by 1909. This also may have been a result of the new entertainment— the movies — that began to replace the theaters on upper Broadway. The Palace plot was sold in 1911 to William Fox Amusement Company which planned a “moving picture and vaudeville house.” Eventually the site became just a movie theater — the Nemo – as it appears on the 1916 real estate map. 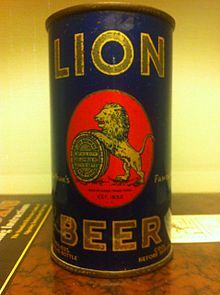 By 1919, an H. A. Murray is noted as President of the Lion Brewery. He was Pauline Schmid’s husband — so perhaps we can conclude that Mrs. Schmid had settled with her daughter and passed along management duties to the next generation while she spent more time in Europe. When a large fire ravaged the brewery again on the Fourth of July in 1927, Mr. Murray, the President, had to return to the city from a polo match. A Times article quoted him speaking of the Schmid family’s early farm and mansion on the site of the brewery – erroneous family history. This entry was posted in Lion Brewery, Lion Palace, Lion Park, Schmid, Uncategorized. Bookmark the permalink.